When Voyager II flew past Neptune in August of 1989 it revealed a complex system of 13 moons, six of which had never been seen before. Thirty years later, scientists say the space probe missed one. Using data from the Hubble Space Telescope, astronomers have discovered an elusive seventh ice moon around the ice giant that fell just out of Voyager’s field of view. Its new name is Hippocamp. After the flyby, Voyager II did take images of the entire Neptune system, but Hippocamp was too small and faint to be detectable in those pictures, he said. Neptune is the eighth planet in the solar system and orbits the sun at the staggering distance of 2.8 billion miles. That’s roughly 30 times farther from the sun than the Earth. It is so far away that our best space-based telescopes struggle to make out its smaller satellites. 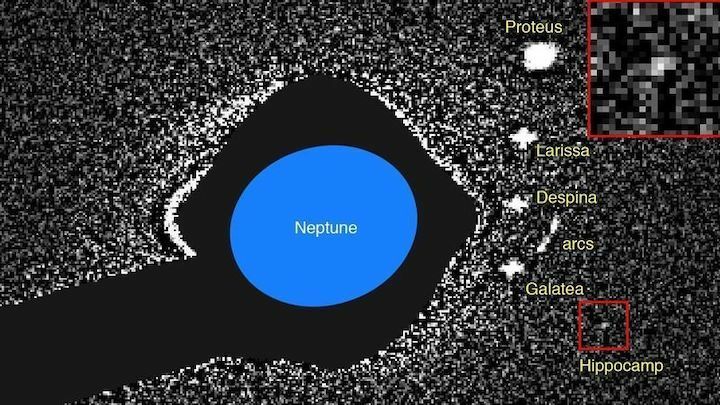 Hippocamp does not appear in Hubble images of the Neptune system, even in a lengthy five-minute exposure. “We overexpose Neptune by a factor of 50 and even then Hippocamp is below our detection threshold,” Showalter said. To find Hippocamp, scientists used a complex and time-consuming process that allowed them to stack eight Hubble images on top of each other, essentially creating a single, 40-minute exposure. They originally invented the process to study the faint arcs, or incomplete rings, around Neptune, but then realized it could be used to detect small, hidden moons as well. “We reapplied the analysis to the whole image, and that’s when Hippocamp showed up,” Showatler said. 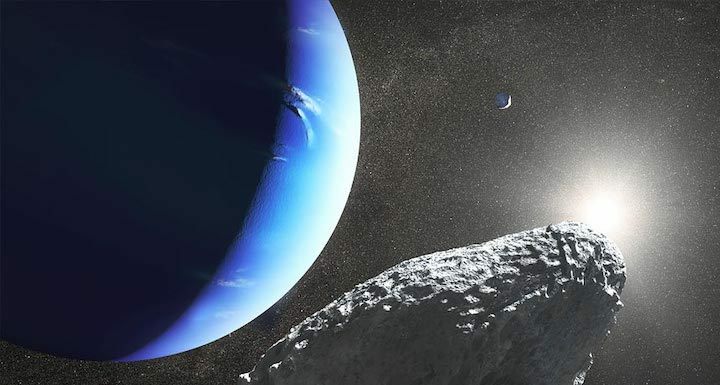 The research team first announced that it had probably found a new moon around Neptune in 2013. Three years later the team was granted some more time on the Hubble Space Telescope to determine its orbit and get a better idea of its size. “When you make a discovery like this you announce it as promptly as possible so the scientific community knows, but that’s really the beginning of the process, not the end,” Showalter said. 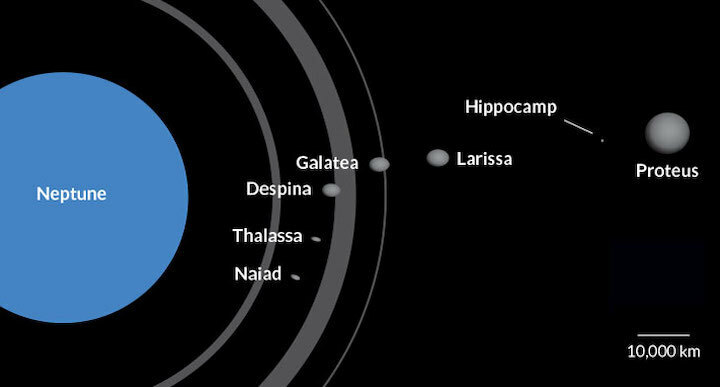 So far, the researchers have determined that if Hippocamp reflects 9% of the sunlight it receives, like Neptune’s other inner moons, then it is probably 20 miles in diameter. 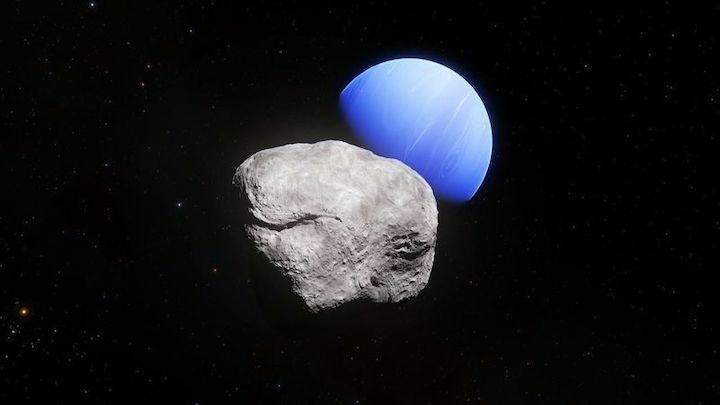 They have also concluded that based on its orbit, it was once much closer to Neptune’s much larger moon Proteus, which has been slowly spiraling away from its host planet. That may not sound that helpful, but to the scientists, those two data points suggest an origin story for the small moon. Voyager II revealed an enormous impact crater on Proteus that suggests that the moon suffered a powerful collision that almost tore it apart 4 billion years ago. That impact would have raised a big cloud of debris, some of which spiraled away into space, and some of which might have formed Hippocamp. But this is currently just a guess. “Whether Hippocamp formed in place from material that did not originate from Proteus or was born of Proteus remains to be determined,” wrote Anne Verbiscer, an astronomer at the University of Virginia, in an essay accompanying the paper. Showalter is an expert at finding small, faint objects that lie great distances from Earth. Over the course of his career he’s discovered six moons in the solar system — one at Saturn, two at Uranus, two at Pluto and now Hippocamp. However, he thinks it is unlikely that any other hidden objects will emerge at Neptune. The technique he used to find Hippocamp should have revealed any objects at least half as bright as the moon. But if we could send a spacecraft out to Neptune, who knows what we might find. CHIP OFF THE OLD BLOCK A massive collision that left Neptune’s second largest moon, Proteus (as seen in the background of this illustration) with a huge crater may have spawned its smallest moon, Hippocamp (foreground). 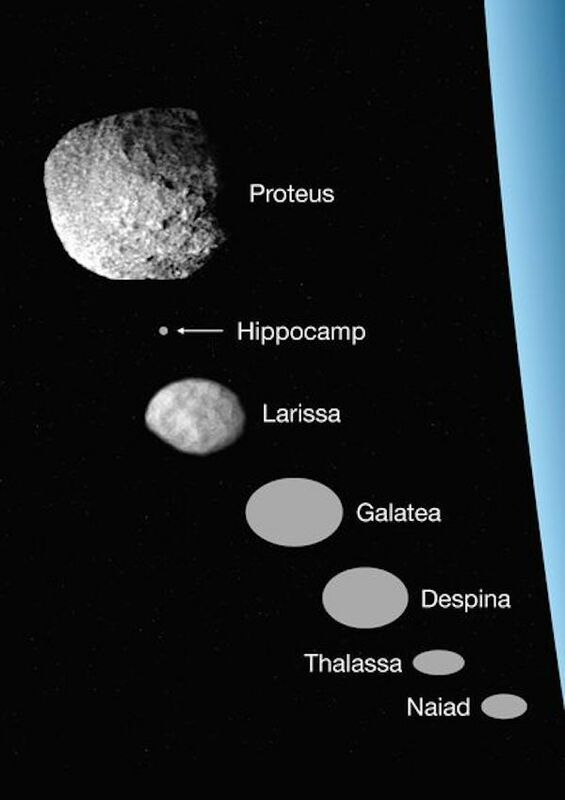 Neptune has seven inner moons (illustrated here with the planet’s rings), and the smallest now has a name: Hippocamp.